They don't fly well in the air, but under water? That's another story! 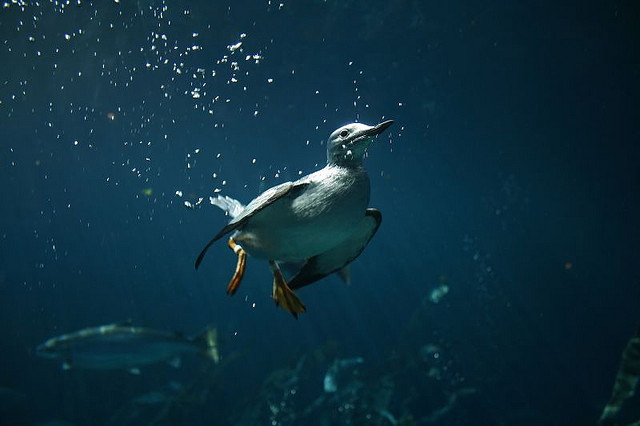 The Common Murre is among the few species of birds that can "fly" under water. When above the water, the 18"-long murre must flap frantically to stay aloft. But beneath the waves, with its flipper-like wings partly extended, it is a streamlined, masterful swimmer. Common Murres, black and white torpedoes with feathers, chase down fish even several hundred feet below the surface. Cornell's Macaulay Library offers audio and video of Common Murres. The miracle of flight – that enviable ability is what birds are best known for. Yet among the nearly 10,000 bird species worldwide, only a few dozen can fly under water. The Common Murre is among them. We most often think of the penguins of southern latitudes as underwater fliers par excellence. In the Northern Hemisphere, it’s the family of seabirds called alcids or auks that wing their way under the marine surface. Puffins [Call of a Tufted Puffin], murrelets, guillemots [call of Pigeon Guillemot], and Common Murres are all underwater fliers. When flying above the water, the 18”-long Common Murres must flap frantically to stay aloft. But beneath the waves, using their flipper-like wings, they are streamlined, masterful swimmers, black-and-white torpedoes chasing fish even at depths of several hundred feet. To reduce drag, the murre holds its wings only partly extended, flying through the submarine world with powerful strokes. Bird sounds provided by The Macaulay Library of Natural Sounds at the Cornell Lab of Ornithology, Ithaca, New York. Call of the Common Murre colony 137898 recorded by M. Fischer; Common Murre individual recorded by Thomas G. Sander; call of Tufted Puffin 3861 recorded by E.S. Booth; call of Pigeon Guillemot 109262 recorded by G.A. Keller.